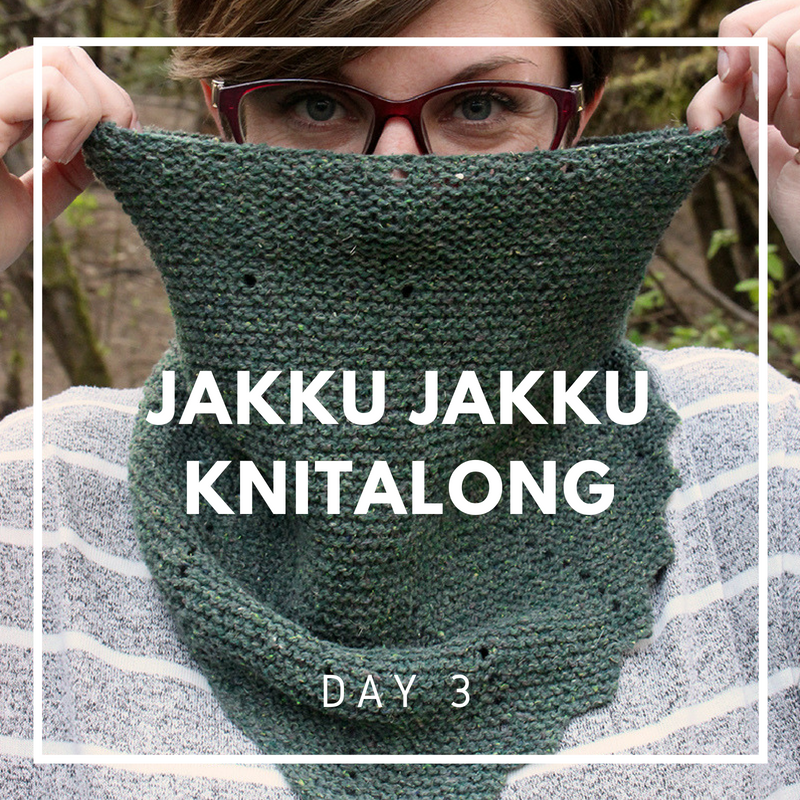 Can you believe we're already at the final week of the KAL? Man, time sure flies when you're knitting something good, right?! So, let's get right down to the business of finishing this WIP! The bind off noted in the pattern is a pretty standard edge bind off: k1, *k1, pass first stitch over; rep from * to end. This is a great method to give a nice sturdy edge to avoid a project getting too drape-y and hanging funny/stretching. This is especially important when working with garter stitch which can tend to grow quite a bit when it's wet block (which we're going to be doing shortly). Here's the problem with the standard bind off provided in the pattern: if you're a tight knitter, chances are you're also a tight binder-offer. What can happen if your bind off is too tight, is your knitting can pucker along that bind-off edge and no amount of blocking will smooth it out. A trick that many knitters are familiar with is to go up a couple of needle sizes to perform the bind off. This can absolutely work but I'm lazy and I don't want to go dig up another needle! So, I have a solution for you: the Elastic Bind Off. Not only is this bind off looser (generally) but it also has a small amount of stretch to it (hence the name) that can alleviate the issue of a too-tight standard bind off. To work the Elastic Bind Off (without changing your needle size): k1, *k1, slip 2 sts purlwise to LH needle, k2tog tbl (knit 2 sts together through the back loops); rep from * to end. Essentially, each stitch is processed twice so there is additional yarn between stitches so it can stretch. Here's a video demonstration. Please be aware that in the video, the presenter doesn't use the "k2tog tbl" terminology. Instead, she says "using left needle, slip into the stitches in the front". Neither is more or less correct, we just use different words. A TIP ON WEAVING IN THOSE ENDS! When I'm weaving in my ends, I tend to not trim my tails until my project is completely dry post-blocking and I'm removing it from the blocking mat. When a knitting project gets wet it tends to get pretty loose and stretchy. If an end that has been woven in is cut short/close to the work before it gets wet, the tail can pull out of the stitches it's been tucked behind and you're left with little ends that are super hard to weave back in. Here's a great video to help you weave in those pesky little ends! If you're familiar with wet-blocking your projects, you can skip ahead to the Pinning Your Project section below. But for those of you who have previously not blocked (you're not alone) or have used the Steam Block method, here's a breakdown of how I like to wet-block my projects. Step 1: Fill a large bowl (or a small sink) with lukewarm water and a couple drop of your favorite wool wash or essential oil (the latter is just for scent). Step 2: Completely submerge your project in the water and allow it to soak. I don't recommend agitating the project, albeit this yarn (if you're using the Berroco Remix Light) is unlikely to felt. Step 3: Allow the project to soak for 15 to 20 minutes (or longer - it won't hurt anything) to allow the fibers to fully saturate with water. Step 4: Remove the project from the water. Push the water out of the project by squeezing it between your hands or pushing it against the edge of the bowl/sink. Just be super duper careful that you don't twist or wring the project. This can cause distortion to the fabric. Step 5: Roll your cowl loosely in a hand towel and press out as much remaining water as possible from the cowl into the towel (I'm a poet and didn't know it)! While you CAN skip this step if you'd like, it simply means a prolonged drying time and a damper pinning session to follow! Thankfully, this cowl requires very little fussing over pinning it out. I used just a handful of pins to block out the points along the edge of the front of the cowl and let the rest of the project do its own thing! I found the easieset way to block this cowl is to turn the cowl so that you're looking at the back seam (this was the begining of round as you worked - you'll see a vertical jog between your knits and purls at the back of the project) and laying what would be the front of the cowl facedown on the mats. 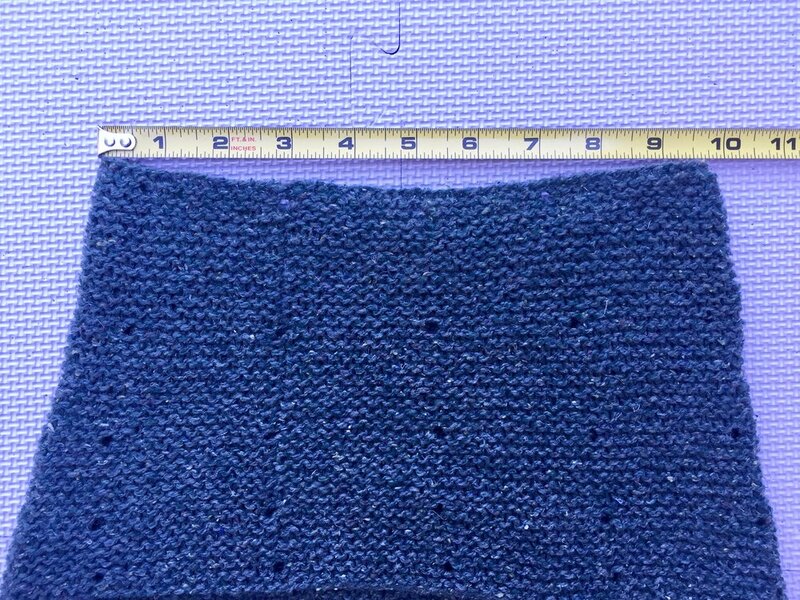 In Pinning 1.1 you can see I've got the seam facing up (that vertical line running below the 3" marker of the tape measure) and I've just shaped out the top of the cowl to roughly the correct top of cowl measurement. Remember that the top dimension will be half the total circumference. Don't try to stretch that top edge to the full 19" circumference... ask me how I know... we all have those days. LET IT DRY AND ROCK YOUR COWL! Let the cowl dry entirely. You may, if it's not drying very quickly, unpin the cowl briefly, turn it over so the bottom layer (the side that is currently face down) is facing up and re-pin the points. They should keep their "pointy-ness" for easy pinning if you do need to turn it over. Once it's fully dry, unpin the cowl, shake it out, trim those ends and wear your cowl with pride! If you find you have really firm creases along the edges of the cowl where it was folded as it dried, you could give those two edges a quick steam while laid flat over the top edge of an ironing board, but I have found that mind tend to ease out after/during the first wearing! Thank you so much for joining me for this lovely spring/summer KAL! I hope you've had fun, learned a thing or two and are excited to show off your project! We'd love to see your FO's on our NobleKnits Community at Mighty Networks, and if you're on social media, feel free to tag @nobleknits and use #nobleknitsjakkuKAL. Now ROCK THAT COWL!